Enjoy the sound of birds, our resident deer, the babbling creek and our welcoming staff. Exceptional landscaping, paved sites, pool, adult lounge and wow baths. A triple 10 resort in town close to services. The camp is beautiful, but I wouldn’t recommend tent camping here. My family and I planned to stop here for a couple nights toward the end of a six-week camping trip through the Northwest. We’d spent some time previously at the Premiere RV Resort location in Salem, Oregon, and had a wonderful experience. The staff in Salem were very accommodating and our RVing neighbors were nice. (It’s fall, so there weren’t a lot of other tent campers.) 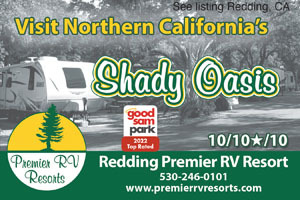 We arrived and checked in at the Premier RV Park in Redding, CA and set up our tent. At check-in there’d been an unusual comment made to us -- they said that they don’t normally rent out the tent sites unless you know someone already staying in the RV park. We thought that was weird, but other than that they were pleasant so we didn’t think too much of it. After setting up, we realized there’s water but no electric at the site. That’s okay, we normally prefer to stay at sites that offer electric but we’d forgotten to check. The camp site in Salem had allowed us to run an extension cord to the nearest electrical outlet even though it wasn’t available right at our site, so I guess we’d mistakenly thought something similar would be available in Redding also. I’m not blaming Premier for that part we should’ve checked. Anyway, we were traveling with our dog and two-year-old son, both of whom refuse to sleep under covers, so we thought we’d ask about running an extension cord to the nearest building so we could use our heater to stay warm at night. My husband and son stopped by the office to ask about this … and they were treated horribly. One of the managers very coldly stated that our camp site was a primitive camp site and doesn’t have electricity. My husband said he understood that, but our site was right next to an outlet, so he was just asking that we could use that to run our heater for the night so our son could stay warm. The manager said, “If you wanted electricity, you should’ve gotten a hotel.” To my knowledge, there aren’t any tent sites available with electricity. So it’s not like we weren’t willing to pay for that if it was available. We’d have even given them some cash for use of the electricity for the night if that was a problem. When we were in Salem, we had employees repeatedly stop by to make sure we were staying warm and even offer us use of their own space heaters. But the manager, for whatever reason, seemed incensed that we would ask for this accommodation. I don’t understand why it was such a big deal. But the way she talked to us, it was like we were vagrants trying to panhandle at their camp site instead of paying guests. And just on a human level, it appalls me that she’s more concerned with proving a point than whether a two-year-old sleeps in the cold all night and gets sick. I really can’t understand this. When I heard what happened, I went into the office and insisted on a refund. If she wanted us to stay in a hotel, then that’s what we would do. It’s unfortunate because our entire family absolutely loves camping. My son is a big fan of the outdoors, and hotels really don’t offer anything for him to do but watch TV. But I couldn’t handle the idea of letting them treat us like that and still keep our money. This is the first time I’d had any contact with this manager or anyone else from the office, since my husband had checked us in. But she knew exactly who I was and began processing the refund immediately, even though she complained that they didn’t do refunds. (Obviously, they do.) I told her she’d been really rude to my husband and that wasn’t okay, and she instantly turned defensive, loud, and belligerent. (I could’ve imagined someone else responding, “Sorry it seemed that way, but …. “ or something polite to smooth things over.) She insisted she hadn’t been rude and wanted to play me the security footage to prove it, then stated two managers had been present at the time. She rehashed that electric isn’t included in our site, which I said I understood but just didn’t appreciate how rude she was about it, especially suggesting we should’ve gotten a hotel. She kept arguing with me. Then -- this was the worst part -- a man walked in (I think this may have been the other manager, but I’m not sure) and the manager said to him, “The TENT PEOPLE are leaving.” Tent people. Are we human garbage or something?. This manager seemed pretty confident she wasn’t going to get into any trouble over this, even handed me her business card. Maybe she’s right. I can only assume there are owners or some type of higher management above her, especially considering that this is a park with multiple locations. I don’t know if they have the same attitudes she does or not. I hope they don’t. I don’t know why any RV park owner would want to deter tent campers, since it’s almost free money for them. The tent sites would just be sitting empty, and we were there to pay to use them. If they don’t want to rent out tent sites though, they should just remove those from their booking site. No big deal. But to treat someone like they’re sub-human just because they’re choosing to camp in a tent instead of an RV? Awful. I can only assume this woman doesn’t believe in any type of karma or god because if she thought her actions would come back around in any way she wouldn’t act this way. I don’t know what more to say. I’m angry, but I really just hope to stop anyone else from going through this. Please don’t tent camp here. And if you’re RVing you’ll probably have a better experience, but please be aware that you’re supporting a place that looks down on people that don’t have thousands of dollars to spend on a nice camper. This place has gone way down hill in every way. Mangers do not know how to treat customers. I won't be back! On a couple of occasions I have witnessed arguments and drunkenness. Place is run down. If they do do any work its on a Saturday morning loud and clear and around your trailer. We stayed at this park for the first night and then again the last night of a month long trip. Both times we found the staff friendly and helpful. The park itself is clean and neat with sites that are level and fairly roomy. 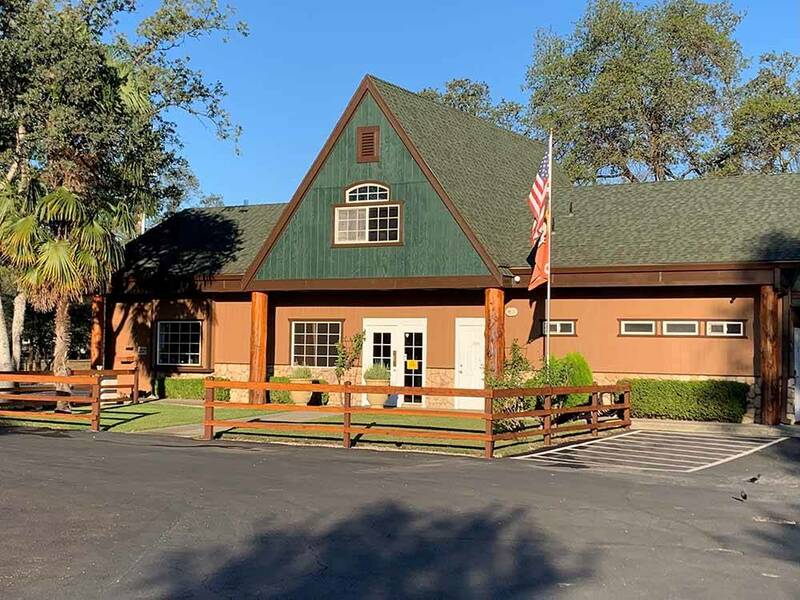 Location makes for easy access to the many outdoor recreation spots in the region as well as easy access to Redding itself. Great park-clean and very nice restrooms, pool was warm, trees. Only complaint was that there were 3 RV's booked together in April for a July stay (we were told we would be together) arrived together and they separated us. We HIGHLY recommend this RV camping location! The manager/owner is friendly, helpful and takes pride in his business. The campground is quiet, extremely clean, beautiful and the individual sites are appropriately spaced for privacy. The location to Lake Shasta is perfect for day trips to the lake. We are marking Redding Premier RV Resort as one of our "will return" locations! Stayed here before and returned again. Easy access to and from I-5. Nice place, friendly staff, clean restrooms and showers. A little pricy compared to others but you know everything is going to work with no problems. Will stop again when going thru the area. Just stayed here for a couple of nights passing thru, but the staff was very friendly and accommodating. We were able to get satellite reception, cell service and WiFI using our hotspot, we did not use the park internet. Site was long enough for our 40' motorhome and tow car and had some grass and a small table. We were able to get in and out of the site with our car connected. Close to I5, but quiet, nice long pull through site and shade trees all around. Grass and concrete patio for our site. Will definitely stay here again on trips north. The staff is very helpful and friendly. The campground and facilities very clean and quiet, only half a mile from Interstate 5. There are three Premier RV Resorts in Oregon, I plan to visit them in the future.